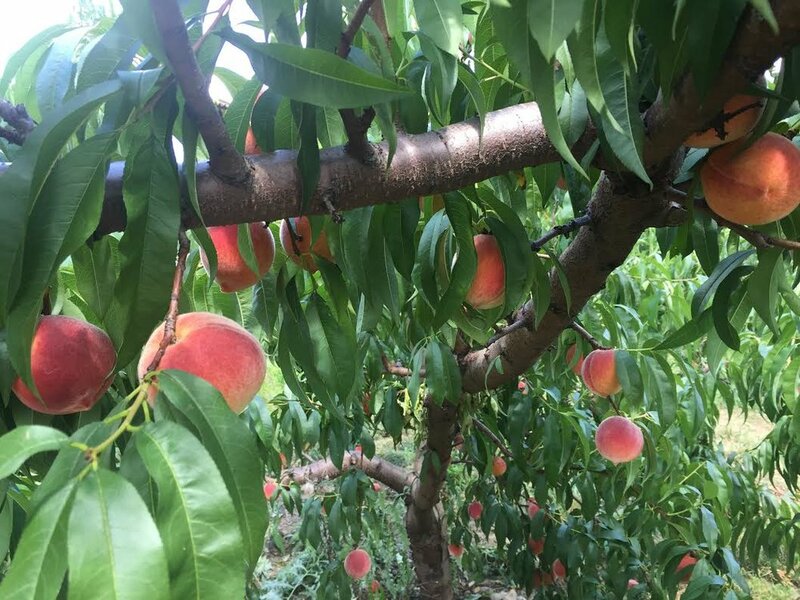 mark my calendar for peach season and fit them into every menu of the summer. Who can resist a fresh peach, eaten out of hand with a stack of napkins? It’s a close-your-eyes-and-savor-this-moment experience. Such a happy coincidence that these gems grow right in our midst. delicious and before I know it, they have vanished. This time I got to work before the tasters swooped in, deciding to add some sizzle to accent the sweet. with creamy Burrata and silky prosciutto atop a bed of lightly dressed arugula. With a hunk of good bread, you have something fancy in a hurry. pick a peck, whether straight from the tree or from your local market. The sweet perfume will remain. Heat a grill pan over medium heat.Brush the cut sides of the peaches with the vegetable oil. Grill the peaches for a few minutes on each side until just tender and warmed through. again and transfer to a serving platter. Arrange the prosciutto, Burrata, and grilled peaches over the greens. Drizzle the salad with the balsamic vinegar and serve. 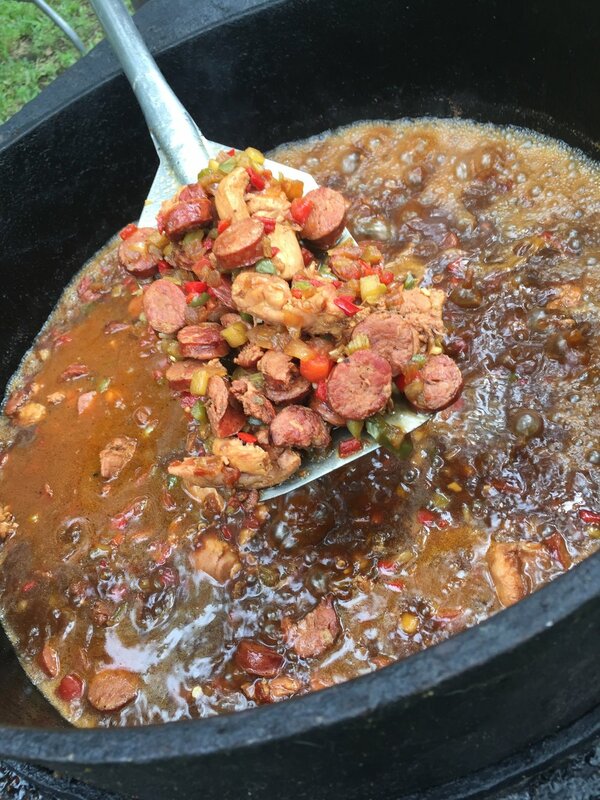 Cue the accordion and grab your dancing partner, it’s time for a little peace, love, and jambalaya, the hallmark of Louisiana backyard hospitality. Every occasion centers around a feast. This one is a thank you party where Chris and Canette Liddy rolled out the red carpet to thank their neighborhood for running to their rescue during the historic flooding event in Baton Rouge a year ago. How do you feed an army of volunteers? 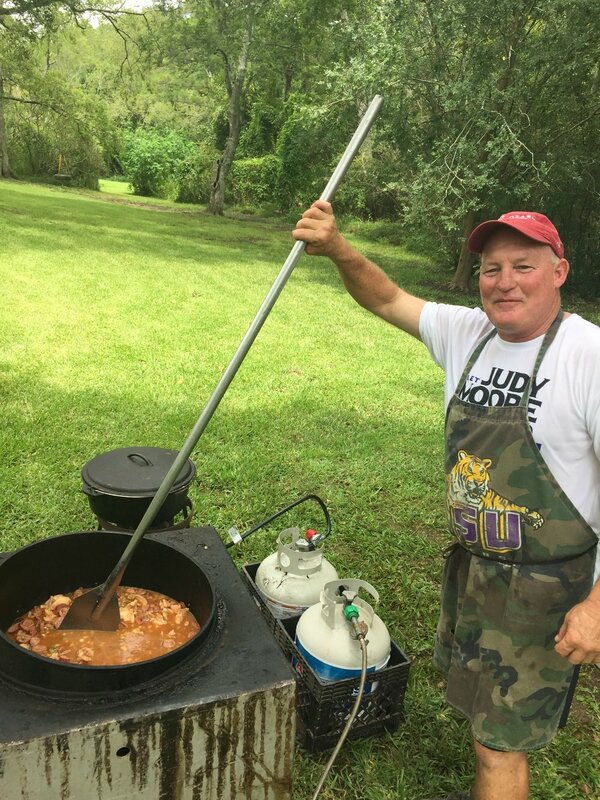 You call up J.R. Vendetto, the king of tailgating, and have him brew up a cauldron of jambalaya, the classic spiced up rice dish that’s a staple in Louisiana. J.R. fashioned a moveable feast in the Liddy’s backyard on a steamy Saturday afternoon and I had a front row seat. 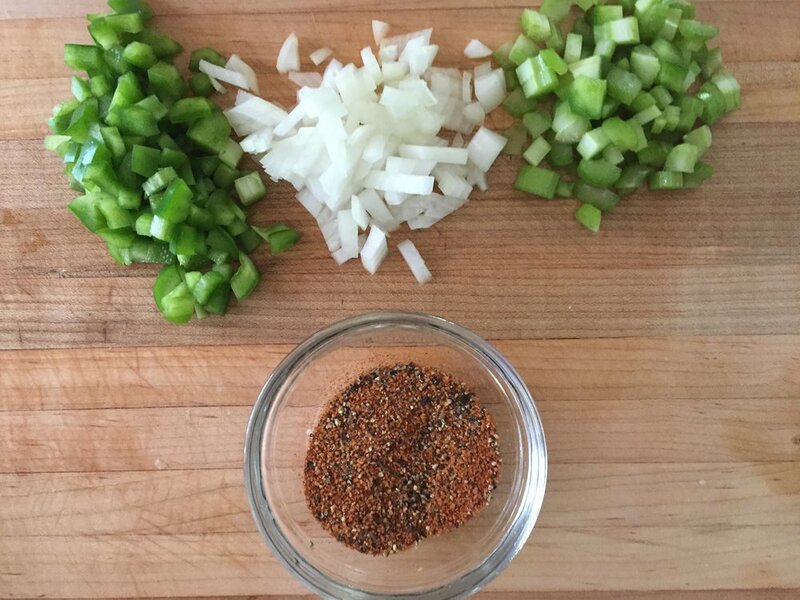 He kicked it off with Louisiana's required holy trinity of cooking--celery, onion, and bell pepper, sauteed in hot oil until almost tender. In went Cajun sausage and chicken, tomato, chicken stock, and handfuls of Tony Chachere’s Creoele seasoning. The colors danced in the pot and fragrant smoke signals reminded the neighbors of the backyard bash. It was time to add the rice, three five pound bags, and I got a turn to stir. While the cauldron bubbled, I worked in the rice with a cooking spoon the size of a pirogue paddle. 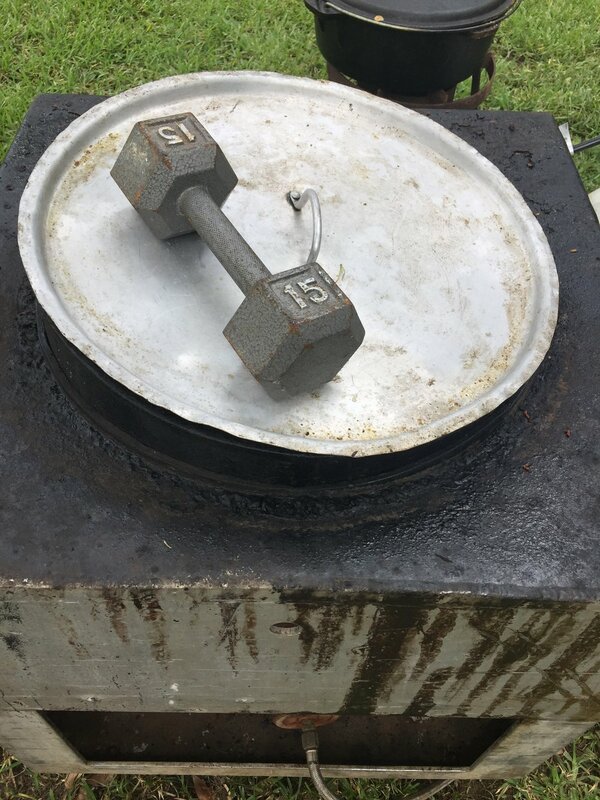 J.R. threw the lid on and slapped down a 15 pound weight. “So no one can peek in,” he said, "we don't want that steam to escape." The rice became one with the flavorful stew of meat and vegetables and J.R. scooped it onto plates for 200. I heard the neighbors hope out loud that this would become an annual tradition. I could raise my glass to that, minus the monsoons. 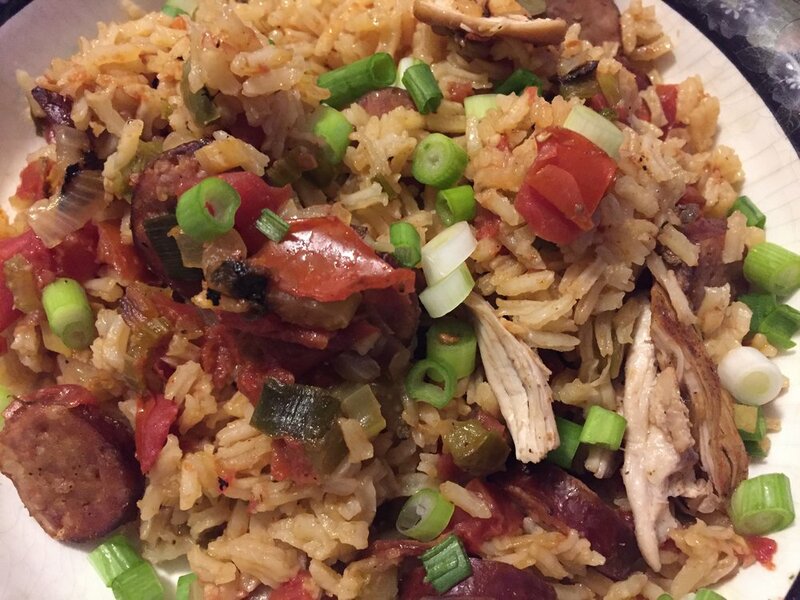 Until then, I’ll work my way through some other classic Louisiana recipes in my kitchen. Follow the smoke signals. Happy Cooking! In case you're not planning a backyard bash, here's a scaled-down version to serve about 6-8. Heat the oil in a heavy Dutch oven over medium heat (I used a deep cast iron skillet) and add the onion, celery and bell pepper. Cook, stirring occasionally, until vegetables are softened, about 10-15 minutes. Push the vegetables around the side of the pot and add the cubed chicken and the Creole seasoning. Toss to brown the chicken, then add the garlic and sausage, stirring for a minute or two to brown the sausage. Add the tomatoes, stock, thyme, cayenne, and bay leaves and stir well. Add the rice, increase the heat to medium-high and bring to a boil. Give the mixture one last stir, reduce the heat to low, and cover with a tight-fitting lid. Cook for 20 minutes before checking to see if the rice is done--if liquid remains, re-cover and continue to cook for 5-10 minutes longer. Stir in the green onions and serve in large shallow bowls. I had bone-in chicken thighs on hand which I first seasoned then browned before adding to the simmering pot. When the rice had absorbed all the liquid, I removed the meat from the bones and folded it in. Alternatively, use boneless chicken thighs .